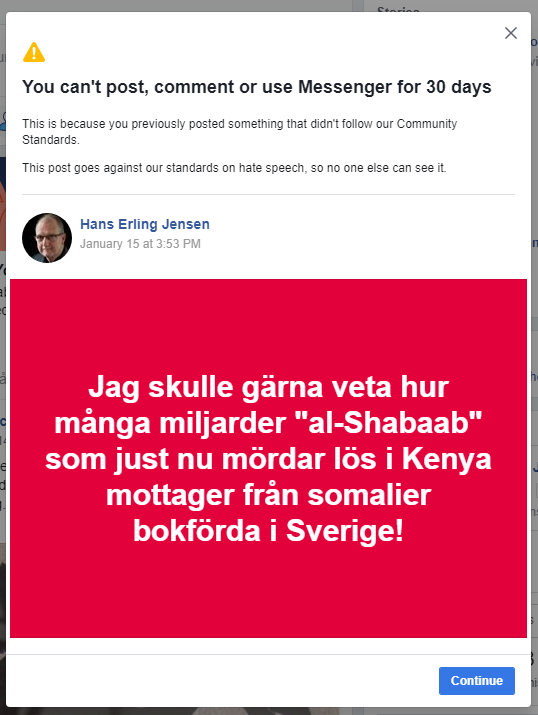 Jag överklagade givetvis domen och Facebook gav med sig! Det finns redan i 2010 ett antal artiklar om somaliers finansiering av terror i Somalia och deras grannländer! Så blockades min profil igen! I was blocked, and then unblocked. And then blocked again for the same post. I have asked a question, and this has absolutely nothing to do with any violation. It is common knowledge in public newspapers for 10 years, that Somalis send money to their homeland and some of these money – billions goes to terror organizations. Why can’t I ask a simple question in this public matter then????? ?